Happy Thursday everyone! Andrew here to help get you through your Thursday slump with some Team Stryker action! 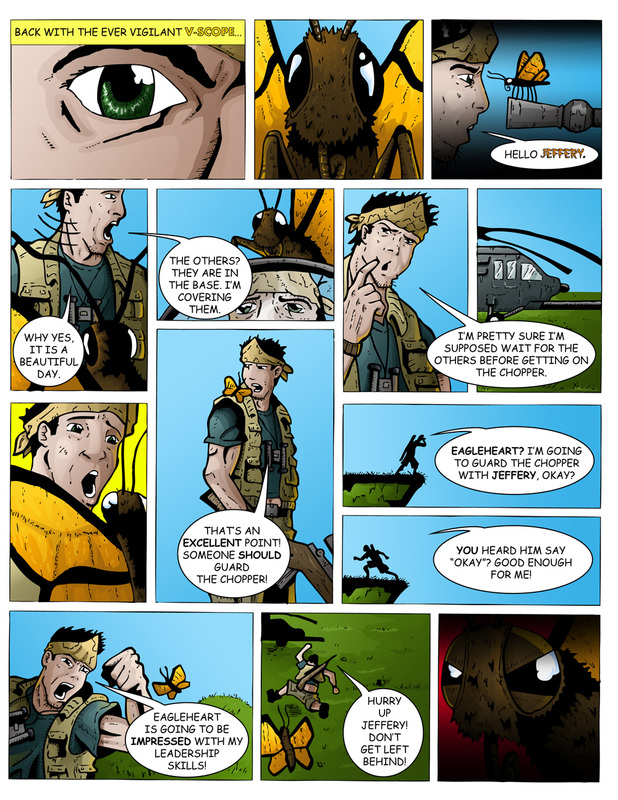 We are more than half way through Mission 001 but we still have one more important character to introduce: “Jeffery the Butterfly”. His existence is known only to V-Scope but that doesn’t make Jeffery any less deadly. As Bart Simpson perfectly put it “No one suspects the butterfly” and Jeffery is that saying personified. Jeffery and V-Scope share a very special bond, a bond which Jeffery will take advantage of any chance he gets. Keep a close eye on him as he will be a key player in Team Stryker in the following Missions. I don’t know about the rest of the gamers in the world but I am feeling the post E3 blues. It seems like all the big players (Sony, Microsoft, Nintendo, EA, Ubisoft, etc) blew their loads so to speak at E3 so now we are left no new games to admire, no new screenshots to drool over and no new rumors to debate. As awesome as game conventions like E3 are they always have a backlash of a news drought afterwards. It seems so unfair to show off cool new games for the first time (Beyond, Tomb Raider, PlayStation Allstars) as well as brand new tech (WiiU, PSone on PS Vita) and then go silent the second the show is done. Now the only articles you can find online are people talking about the event itself and not the content within. At least this year there was no Mr.Caffeine. Have a great end of the week everyone and I will be right back here Monday to satisfy all your webcomic needs. There’s a video game like Team Stryker. I can’t recall the name at this time. It’s recent but has that 80s look and feel.